The diocese of Rayagada is situated in the south of the Indian state of Odisha (formerly also known as Orrisa), which became notorious 10 years ago for the violent attacks against Christians there. It is also the fourth poorest federal state in India. Within the territory of the diocese there are just 50,000 Catholics among a total population of approximately 5.5 million people. Most of these Catholics come from the poorest and most socially excluded levels of society and many live a bare subsistence existence, gathering fruits and firewood from the forests. Most are illiterate and if they are forced to borrow and fall into debt, they face exorbitant interest rates from the moneylenders, with the result that their families fall into a form of debt slavery. The diocese of Rayagada covers a vast area of well over 15,000 square miles (40,000 km²), and many of the villages lie in remote corners in the forests or valleys. There are just 24 parishes, also very large in area, so that the distances to be covered are considerable. Not surprisingly, therefore, the 30 catechists play an important role. They visit the faithful in the villages and are frequently, so to speak, the „visible face of the Church“ in places where the priests only rarely manage to get. But even for the catechists many of the villages are still very difficult to reach. Until recently, the catechists had to make these long and difficult journeys on foot. 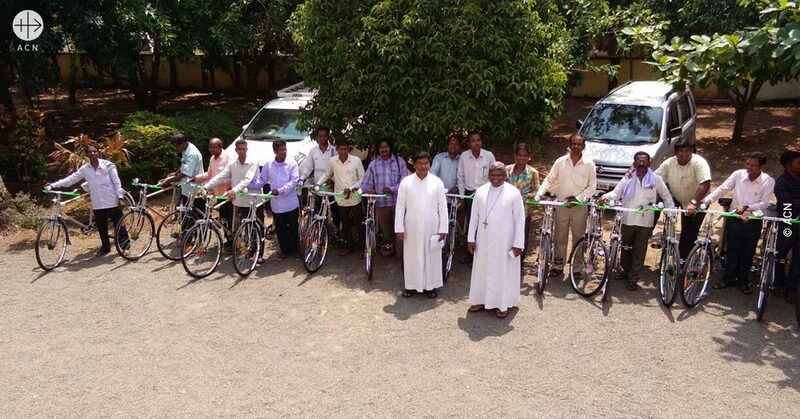 But recently, thanks to the generosity of our benefactors, ACN has been able to help Bishop Alphinar Senapati to provide each of them with a bicycle. Now they are able to reach the faithful much more quickly and easily. You contributed 1,630 Euros for this purpose. Our heartfelt thanks to all who helped us!